As a set lighting technician, Cathcart’s job was to adjust the lighting to the director’s liking. He got to work stringing lights in each tent. “There was a dimmer board operator sitting in one of the tents operating all of the lights and making them flicker like fires. Everything changed about three times,” Cathcart said. The moisture in the air broke and it started to rain. The crew broke for lunch at 5 p.m. and it was on to coffee number four. The rain was relentless but the production continued filming. “After a while, we were all just in rain gear, soaking wet – you couldn’t even see the black of my rain pants because they’re just covered in mud. At the end of that day, I was ready to be done,” he said. At 3 a.m., the production finally calls wrap. Cathcart watched as the directors and actors left set followed by other departments. Helping to wrap out the rest of the heavy lighting equipment, he and his fellow electricians stay behind. A faint orange glow bloomed on the horizon. Cathcart helped himself to a sixth cup of coffee. America’s labor unions have fought for better conditions since the mid-19th century, often fighting for these rights with literal sweat and bloodshed. While many people may know the Screen Actors Guild for its award season honorees, other unions exist in the interests of working crew members. Take the International Alliance of Theatrical Stage Employees as an example. Some of IATSE’s workers constitute the locations managers, electrics and grips, or craft services employees who keep the sets moving through rigorous production schedules. Contracts exist between productions and the unions to determine how a show will operate within a specific geographic region. However, given the difficulties of scheduling a $100 million show such as “House of Cards,” the traditional expectations for modern working conditions simply don’t exist. Tyree, 33, said that when working on Michael Bay’s “Transformers” films in D.C., the production never broke for lunch, instead opting to pay meal penalties upwards of $100 to ensure making their 14-hour days. While crew members had access to food and water provided by craft services throughout the day, a crew lunch would have allowed them the opportunity to take a sit-down break. Meal penalties are consequential fees that production pays to union paychecks for not breaking its crew and allowing members to have that opportunity. “The guys who were on that show full time were making more money in meal penalties than on the hours that they actually worked,” Tyree said. However, a more troubling aspect for many workers is the long hours. Most union contracts stipulate that crew members are given at least nine hours of turnaround time before having to return to set, Tyree said. But come Friday, producers no longer have to worry about turnaround because crews are off Saturday and Sunday. His first week of production on “Veep,” Saada worked a 21-hour day, stretching overnight into Saturday morning. Saada said that weekends are then spent playing catch up for your sleep schedule. “Deterrents” exist in union contracts which are intended to protect workers by charging production for long hours and meal penalties, Tyree said. Anytime union crews have to work overtime past the 12-hour minimum or they are not broken for lunch, they are given penalty payments. However, when producers have to squeeze extra hours or additional crews into a production in order to meet deadlines, overtime charges are the last things they worry about. “I was getting off of work and maybe having five hours off the clock and going right back to work,” Tyree said. These types of physiological responses to lack of sleep have sparked the interest of sleep deprivation researchers and mental health practitioners. Waltos said that lack of sleep leads to an increase of the hormone cortisol, which the body releases in response to stress and helps manage fight or flight responses. However, prolonged cortisol production in a high stress environment – such as an overnight, exterior film set – can result in lowered memory, muscle strength, reaction times and alertness. “It’s good for either fight, flight or freezing, which aren’t a lot of good options when you need to be expansive and creative and problem solving,” Waltos said. On a different episode of “House of Cards” a few months later, Cathcart prepared for a company move after a split day. All of the trucks needed to get packed up and driven to an exterior parking lot for the remainder of the evening’s shoot. The crew arrived just as it began to rain. Cathcart unpacked the truck and discussed the lighting plans for the evening with his fellow electricians. Cathcart radioed to his coworker in the pocket, asking if they want a coffee or if they need to step away to take a break. Production wrapped for the evening and the crew hastily packed up their gear, ready to get home and out of the rain. It was 3 a.m. and after a 16-hour work day, Cathcart found himself groggily driving home on Interstate 83. A blur of red taillights flashed in front of him but he couldn’t react in time. He slammed into the back of a white box van and totaled his car. Over the next month, the production company made a rental car available to Cathcart so he could continue to commute to work. “They were there for me as long as I needed. ‘If you need anything at all, please ask,’ that sort of thing,” he said. As a production assistant, Evelyn Fogleman, 23, was usually the first one on set and the last to leave. Her mind was racing. Grab the sides for the day, get actors to rehearsals, grab coffee for the directors, take actors back to base camp, go through the shoot, assist with crew movement, repeat, repeat. Time sheets and paperwork at end of the day. In 1997, assistant cameraman Brent Lon Hershman died in a car accident driving home from a 19-hour day on the Los Angeles-based set of “Pleasantville.” Since then, cinematographers Haskell Wexler and Roderick E. Stevens have lobbied production companies in Hershman’s memory. Together they started the non-profit advocacy group, 12on/12off, which fights for a guaranteed 12-hour workday and at least a 12-hour turnaround. In July of 2013, the 67th Quadrennial IATSE Convention unanimously agreed to the “Long Hours Resolution.” This agreement moves that labor management will continue to make fatigue associated with long hours a paramount concern in any labor dispute with production companies. However, lobbying groups fight an uphill battle because of the difficult nature of production scheduling within the film industry. Long days are often essential because of time limits imposed on access to locations or to meet production deadlines. Tyree said that the example of having Camden Yards for an overnight shoot may require a longer workday. “I’m not talking about those days,” Tyree said. “I’m talking about the daily grind. There is no reason why you should have to do a 16-hour day after a 16-hour day, especially in a controlled environment,” such as on a studio set. Saada said he wished there was more pressure on insuring a better turnaround with a five-day work week. With more time to sleep and see family and friends, crews would be happier. Tyree said that everything written into production contracts are meant as ways for the union to protect its members and to insure safe film sets. However, when it comes to producers abiding by those contracts, he is less than optimistic. Many workers may treat overtime pay as a deterrent for long hours, but producers may see it as an incentive for workers. A friend of Tyree’s once spoke with an accountant in motion picture work. While discussing triple overtime, the accountant treated it like workers would be happy to have the money. His friend responded in disbelief, noting that no one actually wants to work triple overtime. Tyree said the accountant had never considered that workers may not care about the extra pay. Tyree’s longest day of billable hours was 22 and a half hours. He asked why producers would want to pay the overtime on such a day when production could easily split it into two 12 hour days. “Don’t kill anyone. Save yourself some money and make sure you’re getting your quality,” Tyree said. But so far, production has continued as it always has. Mustering universal agreement has been difficult, but Tyree said he feels there is a consistent theme in the relationship between crews and production companies. However, Saada said that neither the unions, nor the production companies are truly at fault for long hours. “It’s a fault of the nature of the industry,” Saada said. He added that the film labor industry started without minimum hours and workers passed that foundation down from generation to generation. But that mentality does not affect worker’s love for this occupation. For all the lobbying efforts he takes part in, Tyree said that he could not see himself doing anything else. 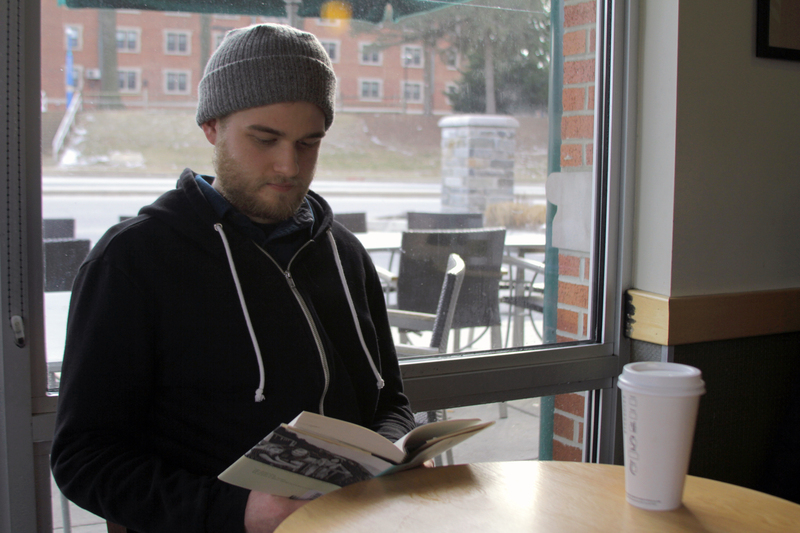 Brendan Cathcart, 24, reads Joan Didion’s “The Year of Magical Thinking,” at Towson’s York Road Starbucks. Film industry workers can rarely find downtime for personal leisure given hectic production schedules (Photo by Mark Burchick). Sipping a leisurely latte at Starbucks during his off-hours, Cathcart reads Joan Didion’s “The Year of Magical Thinking.” He tugs on his tweed driver’s hat and squints in thought. He folds the right corner of the page down to mark his place and sets Didion aside. Cathcart came from a photography background. He learned early on that his strengths were in the technical aspect of photography. His career in film emerged after helping a photographer and gaffer move lights on a film job. Two years later, Cathcart now dreams of being a gaffer, the head electrician in charge of the lighting plan for a production. As he describes his venture into the film industry and the regular 12-hour work days, Cathcart stares plainly, emoting nothing. Yet Cathcart’s future is uncertain. He only gets hired if he gets a phone call, and he only gets that phone call if the job is local. Cathcart tosses the empty cardboard cup and slips Didion back into his backpack. He has precious off-hours to enjoy while they last. Awesome post! From the content I’m sure you’ve seen the documentary “Who Needs Sleep,” quite good and relevant. Great work dude! Thanks Gino! Yeah, I spent a lot of time on this and I’m really proud of how it came out. There is a lot more work that can be done for MD’s Film Economy and I’m happy to see the conversation continuing.